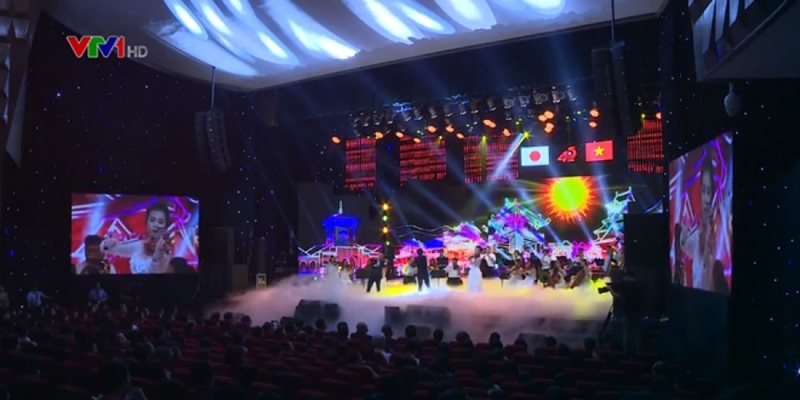 A music festival celebrating the 45th founding anniversary of diplomatic relations between Vietnam and Japan took place in Ha Noi on September 9 night. The festival was co-organised by Vietnam Television (VTV), the Ministry of Foreign Affairs and the Ministry of Culture, Sports and Tourism. Speaking at the event, Vietnamese Deputy Foreign Minister Le Hoai Trung and Vietnam-Japan and Japan-Vietnam Special Ambassador Ryotaro Sugi talked about the bilateral friendship and cultural exchange that date back to nearly 1,300 years ago. A performance at the music festival. Cultural similarities and links between the two nations throughout history have laid a firm foundation for the current extensive strategic partnership, they said. A series of myriad activities, including the music festival, have been held in Vietnam and Japan to mark 45 years of diplomatic relations, thus boosting mutual trust and understanding between the two nations. VTV General Director Tran Binh Minh said the idea of organising the music festival began a year ago in preparation for the celebration. “Through music, we honour the cultural beauty of the two nations. They share similarities but each has its own identity,” he said. The highlight of the festival is the song Gap Toi Hoa No (Flowers Blooming When I Meet You) exclusively written for the event. Popular songs from the two countries were also performed, including Doraemon no Uta and songs written by Vietnamese musician Trinh Cong Son. The cmusic festival gathered Vietnamese and Japanese leading artists, including My Linh, Dong Nhi, Trong Hieu, The Wings band, Maius Philharmonic, and Sine dance group of Vietnam; and Pikotaro, Godai Natsuko, w-inds. band, Exile Atsushi and especially Ambassador Sugi from Japan. The stage was designed with special effects highlighting the traditional culture of the two countries. The Vietnamese Ministry of Foreign Affairs on September 6 handed over a decision on the extension of the term of Vietnam-Japan Special Ambassador Ryotaro Sugi.